South Africa's ancient rocks bestow clues about the earliest life on Earth. The Makhonjwa Mountains are not the tallest in the world. At 6,000 feet above sea level, the South African range more often resembles tall, green, carpeted hills. They are also not the most rugged, considered a top destination for neither mountaineers nor other high-country adventurers. But these mountains, also known as the Barberton Greenstone Belt, own one very critical distinction: The rocks beneath them are among the oldest in the world, born on a cool and strange early Earth nearly 3.6 billion years ago. These geologic timekeepers are one of the few places on the globe that preserve the gradual evolution of our planet, including its land composition and oceans, through a span of time difficult to fathom on a human scale. They are also one of the few places on Earth where evidence of ancient life can be found. Locked in this mountain range in South Africa are the recipes for the complexity of life we know today. This is what brought Clark Johnson to South Africa. A professor of geoscience at the University of Wisconsin–Madison, Johnson and his collaborators around the world study Earth’s geologic past in order to better grasp when and how life on the planet began. They also hope to better understand where we are headed. 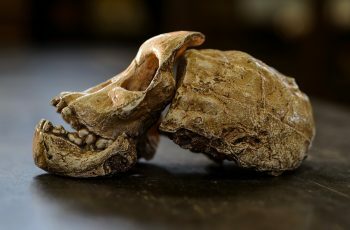 The history of life on Earth is, in large part, the history of oxygen, “because without the presence of oxygen, being able to breathe oxygen, we wouldn’t be here,” says Nicolas “Nic” Beukes, a South African geologist at the University of Johannesburg who for decades has been one of Johnson’s most important collaborators. Oxygen, a simple gas that exists in our atmosphere as a partnership between two single oxygen molecules intimately bound together, transformed the planet from a mostly inhospitable, barren chunk of rock to a wildly diverse domicile for everything from bizarre single-celled organisms to complex animals like apes and people. The origins of that first oxygen are part of a story Beukes and Johnson are starting to piece together, rock by rock. And it begins with an unusual collection of rock from Barberton that together they began to study in 2013. Much like astronomers, who can look back in time by capturing data from many light years away, geologists can peer back into Earth’s history by studying rock records that extend miles beneath the planet’s surface. Beukes has access to ancient rocks so well preserved they reveal some of the planet’s earliest secrets. They come in the form of mining drill cores donated to him by companies in search of rich deposits of diamonds and gold, manganese and chrome. South Africa is known as much for its mining industry as its wildlife — it’s one of the most-drilled places in the world. These rock core samples collected from the Barberton Greenstone Belt are estimated to be more than 3 billion years old. The yellow labels mark the depth in meters at which they were found underground. These cores offer potentially priceless scientific opportunity. While very old rocks can be found in Wisconsin and elsewhere, most have been altered over time by high temperatures, pressures and mechanical forces, known collectively as metamorphism. This may have changed or destroyed the records they might otherwise have preserved. 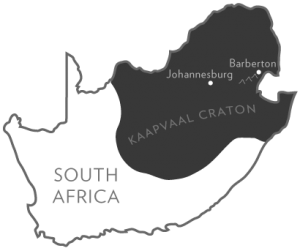 The cores from Barberton formed in Earth’s infancy and were largely spared from metamorphism due in part to its location on the Kaapvaal Craton, a relatively stable portion of Earth’s crust. Because they were drilled from deep underground, the rock within the cores was also spared the damage of weathering that takes place near the surface. 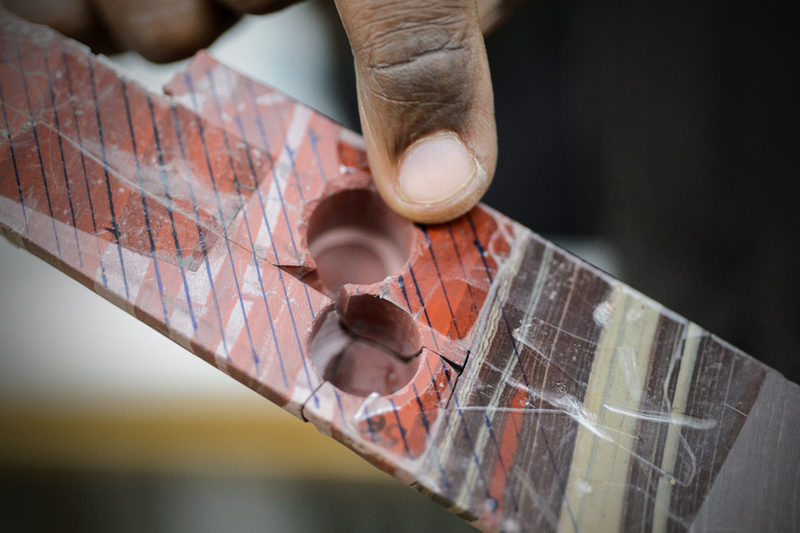 One such drill core from the Barberton Mountains that Beukes obtained in 2012 is marked by striking bands of color and texture. It extended to a depth of 500 meters, or nearly 1,600 feet. At the University of Johannesburg, tucked inconspicuously between tree-lined streets in the heart of South Africa’s largest city, Beukes and his team in the Centre of Excellence for Integrated Mineral and Energy Resource Analysis have amassed so many rock samples they now store the excess in corrugated metal shipping containers behind their building. A self-described field geologist, Beukes is interested in scouting rocks and understanding their mineral compositions. 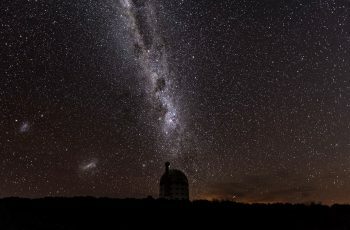 “Nic is one of the gods of early Earth geology,” Johnson says, because much of what the world knows about early Earth geology as told through South Africa’s rock record is due to his tremendous efforts. Johnson is a specialist in the chemical story locked within these very rocks and minerals. 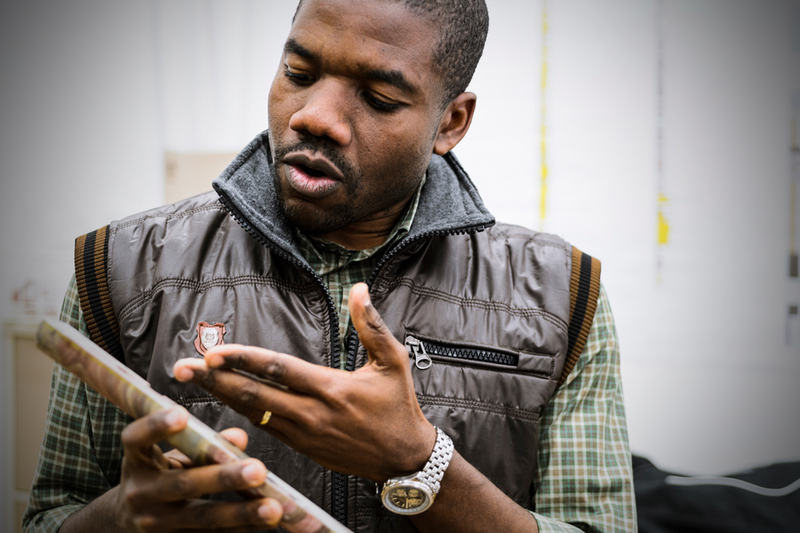 One of Beukes’ postdoctoral fellows, Hervé Wabo, conducted the initial analysis of one part of the Barberton core, called BARB4, with an interest in how Earth’s early magnetic field might be recorded in the rocks. Wabo made great progress, spending most of the winter of 2013 examining the striated greens, pinks, reds, purples and grays that characterize the rock. Each pigmented band represents a sediment layer originally laid down on the bed of an ancient sea, the colors a display of the minerals trapped within layers as they formed. At the time, no one was certain what Wabo would find. Then he encountered a problem. Wabo noticed signatures in the magnetic character of the rock that hinted some of the core had been altered by another geologic event that occurred later. 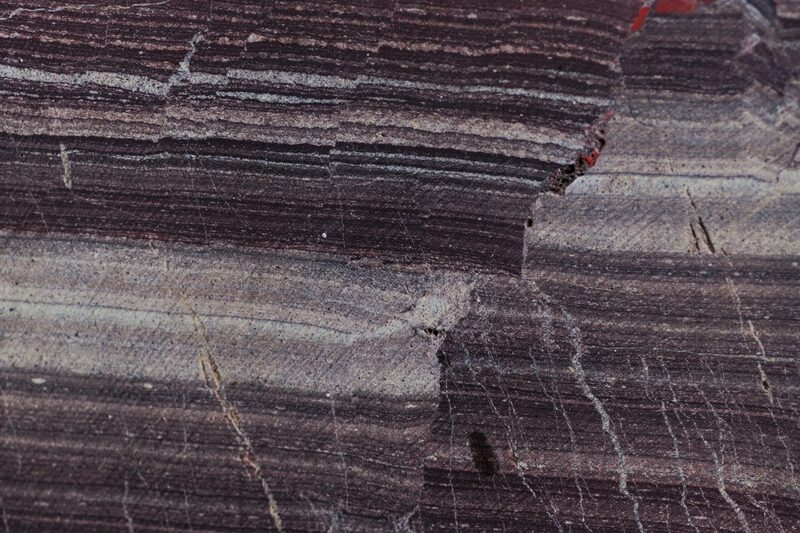 It was geologically and geochemically intact, dating between 3.2 billion and 3.3 billion years old, marked by alternating dark and light layers. Johnson and his team began probing the chemical makeup of those different layers. What they found was surprising evidence about early life on Earth and the oxygen crucial to life as we know it today. The Earth is surrounded by a magnetic field that acts like a protective blanket, blocking harmful radiation from the sun. Without it, life could not exist on the planet. The magnetic field also leaves a signature in rocks as they form, captured in minerals like hematite. This magnetism acts like tiny compass needles pointing toward the Earth’s North Pole and allows scientists to determine where the rocks were on the planet and in what orientation they were when they were created. It also allows researchers to indirectly determine the age of the rock using other geologic data. To analyze the magnetic characteristics of rocks, scientists like Hervé Wabo at the University of Johannesburg remove circular pieces of rock from a larger sample, like that collected at the Barberton Greenstone Belt, and use a special instrument to collect a variety of information about their magnetism. To understand the origins of life on Earth, it’s important to understand the origins of the Earth itself. The story of Earth began approximately 4.6 billion years ago, when a giant cloud of molecular building blocks collapsed under the force of gravity and gave birth to the sun. The leftover material became trapped in the sun’s orbit, forming the solar system. Earth organized around a dense core of iron as hot as the surface of the sun — more than 10,000 degrees Fahrenheit — while a liquid outer core composed of iron and other metals surrounded it. Around these layers, Earth’s mantle developed and, as the new planet began to cool, a crust solidified around its outer boundary, forming land. When Earth acquired its oceans is less clear, though evidence generally suggests the planet became aqueous as far back as 4.3 billion years ago. Looking back now, it was only a matter of time before the oceans harbored primitive life. Sliver of zircon from Western Australia in an epoxy mount at the Wisconsin Secondary Ion Mass Spectrometer Lab. The oldest piece of Earth’s crust ever identified is a microscopic crystal called a zircon, discovered by a team led by UW–Madison geoscience professor John Valley. The microscopic fragment isolated from a rock outcrop in Australia is 4.4 billion years old, revealing that Earth’s crust began forming shortly after the planet was born. In late 2017, along with a collaborator at the University of California, Los Angeles, UW–Madison geoscience professor Valley and a small team of other UW–Madison researchers confirmed the discovery of the earliest fossils of living organisms ever found on Earth, in rock from another geologically stable locale in Australia, dating back nearly 3.5 billion years. Although older rocks have been proposed to contain evidence for life, such rocks have been heated and deformed, rendering the results more controversial. The fossils show that Earth began to sustain life shortly after the planet formed, though it remained simple and microbial. When did life become more complex? The rocks of Barberton captured and held onto at least part of that story, inscribed with hints of oxygen. Around 600 million years ago, just a blink of an eye by geologic time, oxygen became one of the predominant gases in Earth’s atmosphere. This coincided with an explosion of complex lifeforms in the sea, from soft-bodied jellyfish and worm-like creatures, to bug-like trilobites and five-armed starfish. Later, primitive plants began to flourish on land and animals crawled out of the oceans to commence their evolution on dry ground. Oxygen first accumulated in the sea as cyanobacteria evolved metabolisms that allowed them to harness the energy of the sun to break down water molecules and utilize the energy to survive. Oxygen was a byproduct. Scientists don’t yet know when life first evolved on Earth but among the earliest were the cyanobacteria, sometimes called pond scum. Earlier forms of life, like the purple bacteria seen in this exhibit at the UW Geology Museum, did not produce oxygen as a byproduct of metabolism. Cyanobacteria, however, evolved the ability to break down water molecules harnessing energy from the sun, yielding sugar and oxygen. Eventually, oxygen levels rose high enough to support the complexity of life we know today. 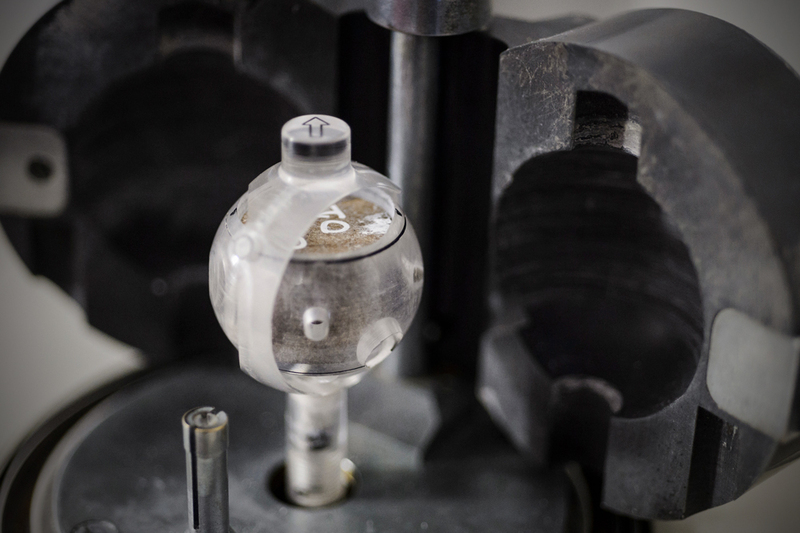 That metabolic conversion, Johnson says, was a challenging one to accomplish because the energy required to break apart the bonds of a water molecule is great. But the payoff — a food source for the microbes — is even greater. It paved the way for complex life. You don’t have to be a geologist to notice the difference in the layers that make up the Barberton core. The researchers determined that the lighter layers must have originated in a flat and shallow basin of water on a shelf of the continent that dropped down into a deeper sea. Through wave action or some other disturbance, the sediments in this basin settled onto the deep ocean floor, eventually compressing into the rock extracted by miners more than 3 billion years later. The deep layers also contained iron, which originally came from deep within the Earth via seeping hydrothermal vents, or seams, on the ocean floor. But the light pink layers, Johnson and his research team found, contained iron that had partially oxidized before it was laid to rest on the bed of the ancient sea. Rocks form as sediments settle and compress, creating a virtual timeline of conditions that existed when those sediments became part of the rock. These sediments can create visual layers, which are often easier to see when the rock is wet. UW–Madison scientists collaborate with researchers at the University of Johannesburg in South Africa to study mining cores rich with sediments that allow them to peer back in time. These rocks, from a drill core called BARB4, were collected from nearly 1,600 feet underground. 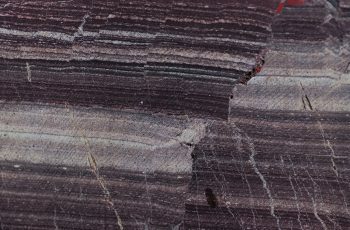 The alternating layers of dark and light sediments in BARB4 reveal that oxygen was present in the Earth’s ancient seas more than 3 billion years ago. The dark layers originated in the deep sea while the light layers came from shallow seas above them. Locked within the light layers is evidence of oxygen, which indicates life must have been present there. Most of us know iron oxidation as rust, the chemical process that plagues vehicle owners after a long, salty winter and turns shiny nails in a bucket of water a dull orange-red. It happens when iron gives up its negatively charged electrons to another element which greedily grabs them up, changing the character of the iron itself. This finding intrigued Beukes, Johnson and the rest of the team, because iron oxidation can occur when the element encounters oxygen. It hinted that oxygen may have been present in the shallow seas where the sediments in the lighter layers originated. So Johnson and his team searched for other clues to help them solve how the iron was oxidized. They looked within the layers for the presence of another element, uranium, which would only have been trapped in the rock if oxygen was there, too. And they looked at the element thorium, which would tell them how fast or slow the sediment accumulated on the sea floor. Locked within the light pink layers, which sedimented quickly and possessed partially oxidized iron, was the giveaway: uranium. The element was not present in the darker layers, which accumulated more slowly. The rock revealed a story: At least as far back as 3.2 billion years ago — and likely longer — there was oxygen in the shallow, early seas. It could only have been produced by living organisms — in this case, microbes known as photosynthetic cyanobacteria. For life on Earth, this oxygen was just the beginning. It took much longer — another billion years — for oxygen levels to increase in Earth’s atmosphere. That, too, is because of iron. Early on, oxygen exhaled by microbes hit the copious iron in the seas and on land. The gas and the iron rapidly interacted through oxidation. It wasn’t until this free iron was exhausted, absorbed like water in a sponge, that oxygen could begin to accumulate in the atmosphere. “It took a long time for oxygen to rust the whole world,” says Beukes. That began a bit less than 2.5 billion years ago, when atmospheric oxygen levels spiked in a phenomenon scientists call the Great Oxidation Event. Eventually, oxygen became a major component of Earth’s atmosphere. That set in motion an evolutionary chain of events that ultimately led to the origins of modern humans, roughly 200,000 years ago.